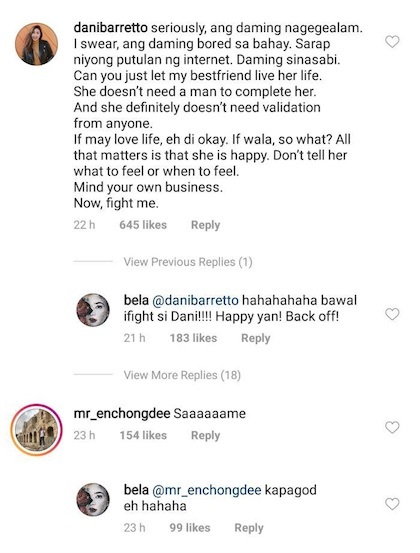 After posting about best friend Dani Barretto’s engagement to Xavi Panlilio, Bela Padilla has been on the receiving end of comments from strangers on the internet pressuring her to get married. Another said, “Taga-plano ng kasal ng best friend pero sariling love life wala?” Bela’s clapback: “Ano pong point?" 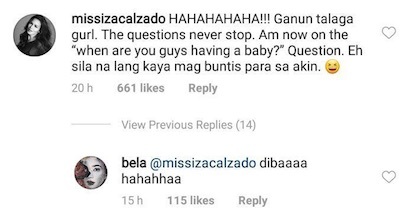 Iza Calzado, who got married in December, commented, “The questions never stop. Am now on the ‘When are you guys having a baby?’ question. E sila na lang kaya mag-buntis para sa akin.” Meanwhile, for Enchong Dee, it was a hard same.